Sometimes when I take my blog pictures I fall into a rut where I’m just documenting my crafts and not making much of an effort with the pictures. I don’t take my pictures creatively. I take them so they clearly show off my work. It doesn’t have to be an either or situation like this. There’s room for both kinds of photos. I just need to work on it so, after seeing some photo a day prompts for January, I decided to come up with a month of craft photos to practice. 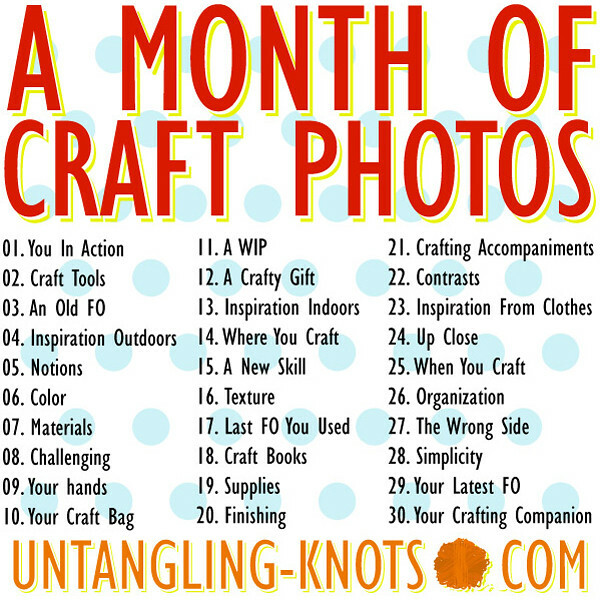 Everyday in the month of February I am going to use this list to take a crafty photo everyday. I kept some of the days pretty abstract and vague so there are lots of options to play with. Each day I’m going to photograph my crafts, craft supplies, and/or craft inspiration, but most of the days can be interpreted in a variety of ways within the overall theme. I was originally just coming up with a list for myself so it was very knit-centric, but I thought it would be fun to invite everyone to play along so I’ve attempted to come up with a list that works for most crafts. I even threw in a 30th day so you can skip a day that doesn’t work for you. If you’d like to join in, I set up a group on Flickr for this so it will be easy to share photos. Please feel free to repost and share the photo prompt if you decide to give this a try. I’m definitely considering this challenge. Normally I wouldn’t stand a chance doing a photo every day, but as they would be based in or around the home, I could probably do this. I will think on it! I think you could use most of these as drawing prompts. That’s actually a great idea for days when I can’t figure out what to draw for my 366 project. It sounds fun! I will give it a try. Hopefully, I can stick with it all month! Thanks, Andi! Oooh, this sounds like fun! I don’t have a Flickr account, so this may be the push I need to finally get one. Thanks for the great idea! Ack! Thanks. I fixed it. What a challenge! Sounds really interesting, I think I’ll join you! Oh this sounds like a fantastic idea!! Gives me something else to post about during the month, thank you for the idea. What a great great GREAT idea! I just bought a new camera for my blog and was wanting to work on my photography. I am SO in! Love this idea – I think I’ll give it a go. Ooooh this sounds wonderful (and your prompts are great!). I’m not sure I’ll be able to commit completely, though, since I am basically only home when it’s dark (except the weekends), so it’d be all artificial light photos :/ I’ll try to think of a solution. Oh this is such a great idea! despite my hectic schedule this may be a good way for me to take a moment to pause-and-craft. love it! Ooh this is great! I’ll blog about it tonight. 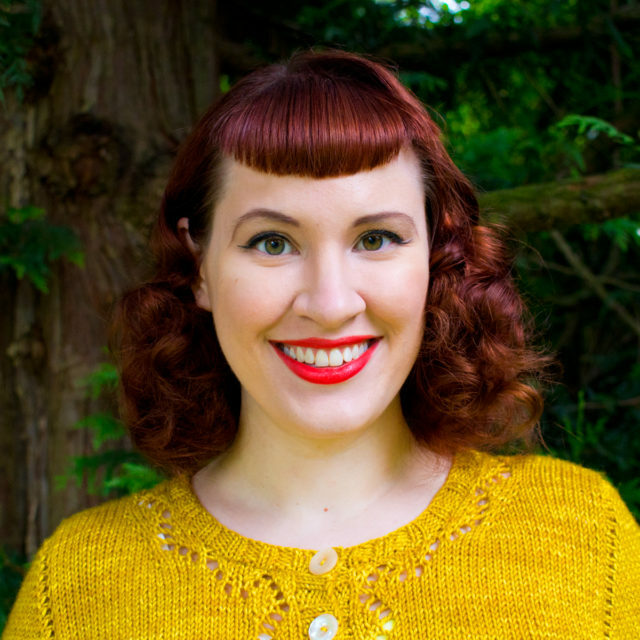 I feel silly asking this, but someone else asked me too…what’s an “FO”? It stands for “finished object” and it might just be knitter’s slang. When you finish a knitting project you end up with some sort of new object at the end like a sweater or a hat, but “FO” is also used to refer to any sort of completed project. Sound like fun and I can’t wait to see everyone’s finished objects and works in progress. Is there a twitter hashtag? I hadn’t really thought about twitter hashtags. Something like #MonthOfCraft is probably easiest, but I’m open to suggestions. I really love this idea and I’m so totally game. I needed this sort of challenge, so thank you for hosting it. This is an awesome idea. Totally jumping on it. Great idea! I’ve pinned it and will be blogging it as well. Count me in! this is a fantastic idea!!!!!! i’m joining in! Thanks to Kelly, I’m in. I’m a little late but definetly going to try to keep this up all month long, just going to have four pictures in my post tomorrow lol 😀 Thanks for the great idea. Can’t wait to see everyone’s. what do you mean by notions? Buttons, thread, pins, zippers, hooks and eyes, notions. I love this idea! Unfortunately I found out about it too late in the month of Feb to join in. I’m wondering….are we allowed to do it in March..? ?